In a revealing video about the Internet access problem in rural Minnesota, Annandale City Administrator Kelly Hinnenkamp below describes her town's struggle with connectivity. The video is the latest in a series on the Minnesota Senate DFL YouTube page intended to shed light on the critical situation in the state. Hinnenkamp describes broadband in the areas outside of Annadale as "horrific." She goes on to discuss how the community's poor connectivity negatively impacts its economic health. She shares a story about entrepreneurs from an artisan spice business once located in Annandale. The company started with online sales but the owners anticipated opening a storefront in the downtown area of the lake community. After contending with eight outages in three weeks, the new business pulled up stakes and moved to Buffalo. Buffalo, located only 15 minutes away from Annandale, offers fast, reliable, affordable fiber service to local businesses. “Broadband is probably the single most important issue in our community right now,” she said. “Our big issue is not that we don’t have service but that we have one provider that has shown little interest in improving it. Broadband is our future." Downloading data for a digital menu board — a task that would have taken 30 minutes at his other restaurants — dragged on for more than four hours. After delays in processing credit cards, watching training videos and transmitting orders, Kormanik switched to an AT & T antenna. But a cloudy day can slow that service. "It's time to stop talkin' and do something." 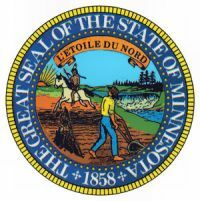 Broadband has been discussed for the past several years in Minnesota. Several task forces and reports have all concluded that lack of broadband in Minnesota, especially in the rural areas, will have detrimental effects on the future. Senator Matt Schmit, a DFLer from Red Wing, introduced SF 2056 [PDF] this session to inspire momentum for local broadband projects. Representative Erik Simonson, DFL Duluth, has been pushing the measure in the House. The bill establishes a grant and loan program focused on local middle- and last-mile projects in areas like Annandale. Dubbed the Border to Border Infrastructure Program, it would bring $100,000,000 from the state's general fund to be applied to broadband projects. The bill has bipartisan support but has not been prioritized by either the Governor or Senate leadership within the Legislature. Meanwhile, Comcast and other incumbent lobbyists have been trying to minimize the fund and any impact it could have. While it may not become a reality this legislative session, the bill has brought serious reflection on the critical need for Minnesota's rural areas. One of the attractive features of the bill is that funds can be used to supplement funding for local projects. This approach allows local communities to determine the best path for their own needs.